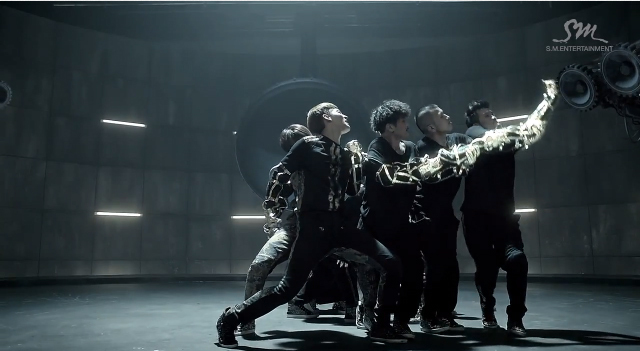 A DBSK comeback is always best approached with equal parts excitement and equal parts trepidation. Excitement for it’s one of the bigger groups off the SM Entertainment roster, and because the boys never really disappoint when it comes to making the best of what they have. On the other hand, there is always a measure of trepidation at how SM either tries too hard, and ends up looking goofy (like their previous release) or just not bother trying (like with half the material off SNSD’s “The Boys”). Given how reaction to “Why? (Keep Your Head Down)” was mixed to say the best, such worries were probably justified. Anyway, enough of the speculation. Better to read on to find out if “Catch Me” makes for a worthy watch. Well, music video lovers certainly would not find too much to like. The whole set-up is standard SM. Think settings in an alternate universe, made up of a grey cave with some mirrors and oddly shaped props. Of course, some SM institutions like the Matrix camera, and an army of background dancers to fill up the “world” also make an appearance. Throw in the obligatory, solo shots of the members emoting to the song, and the whole thing could probably be another chapter in the “How To Make Music Videos, SM Style” guidebook. 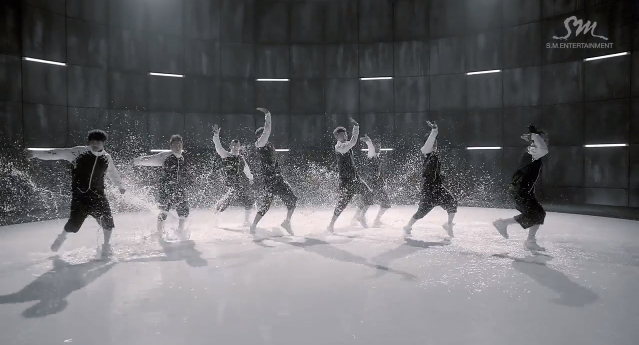 To be honest, the only thing probably worth watching about the video was just the choreography. 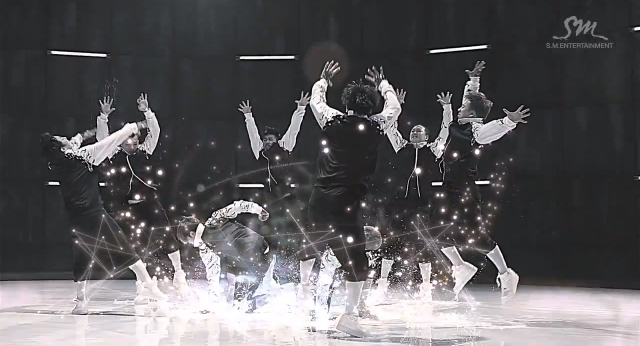 If the music video was not exactly a high point, the choreography was as usual, rather impressive to watch for the most part. 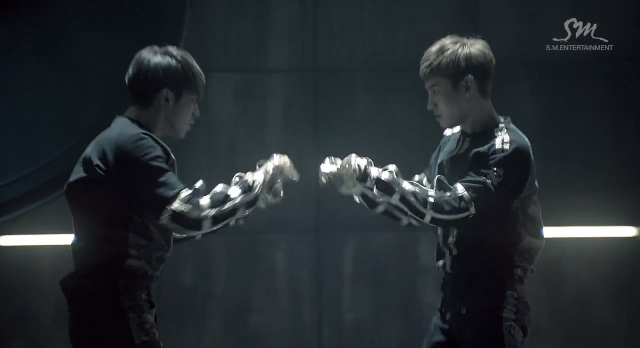 The robot/android inspired shadowing moves seemed innovative and had a masculine cool appeal about them. This contrasts rather nicely with the lighter moves seen by other guy groups these days. Another thing nice about the choreography was also how it seemed to require some technical competence to pull it off, which is rather befitting for a senior group and probably serving as a nice challenge at this stage in their career. The android theme also went some way toward justifying the fashion choices went with this song. While the shiny plastic coats definitely said “Robot”, a computer generated robotic arm is probably still ugly whatever theme one tries to explain it with. So high points for the dance, and a fair bit lesser for the dressing, but it would have to be hard to give any marks for the song. The whole thing sounds very much like an amalgamation of every good Yoo Young Jin idea and most prevailing trends in pop music these days. The song is equal parts classic SMP (Where lilting vocals are overlaid on a repeating beat) for the main verses, a hint of Usher’s “DJ Got Us Falling In Love Again”, and a mix of some dubstep, dance friendly electronic beats, and a dash of autotune. 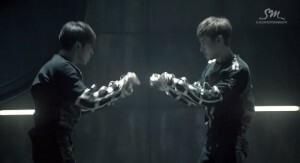 One cannot help but still suspect that a year on, many studio tricks in the book have been used to cover the mid-range gaps in the group’s vocals, especially since the whole song vocally sounds as if it was largely composed of an autotuned/pushed into a slightly higher range low vocal (Yunho’s) or high vocals used mainly for powerful screaming (Changmin’s). Granted Yunho could be given some points for trying his absolute best to make the most of things, but there’s only so much one can do with what they lack, and as a result the song lacks a vocal richness that comes with groups that manage to fill most vocal ranges. While the obvious solution is to add another member to fill in those vocal guess, it was pretty obvious that between trying to work around those gaps, and alienating legions of fans with another member addition, the extra studio post-processing worked out to be far safer. My initial reaction to the song was “nice choreography, but that’s where the praise ceases”. After a few listens, those impressions still hold. While the dances moves were nice and complimented the song, a rather typical Music Video, plus a song that seemingly aims to combine as many ideas as possible, yet endearing itself to few, make for a rather uninteresting listen. Here’s to hoping that the rest of the album is better, as the single scores from me a rather unimpressive 2.6/5.